Velvet is a soft, sensual fabric with ancient history, some say more than 2000 years. Frequent use in royal and religious robes has contributed to its long-lasting popularity. Velvet's undeniable peak was during the Renaissance in Italian cities like Venice, Florence and Milan. The complicated production technique made it a luxury accessible only to the wealthiest. Although velvet nowadays is much easier and cheaper to come by, the association to luxury, power and royalty stands strong up to this day!. Velvet is woven and unyielding (and shouldn't be confused with velour (crushed velvet) which is knitted and has a stretchy quality). The term velvet actually refers more to structure than fibre - it can be woven from both silk, cotton and polyester. Tieroom's velvet products are cotton velvet, the most common kind in fashion, by some referred to as 'real velvet'. 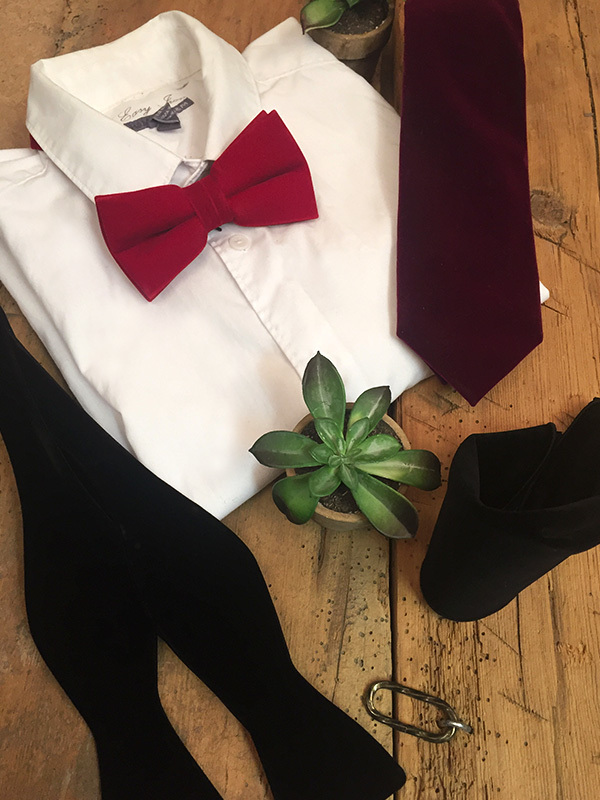 This fabulous material has had many popularity revivals, in more recent years in the 70's, 90's and 2010's, and whenever use, it has added a touch of glamour and luxury to an ensemble, So with some Tieroom velvet added to your festive outfit, you're fit for any special occasion! Buy three ties/bow ties or more and we'll deduct £5/each. Delivery at tieroom.co.uk is fast and free, as always!